'Kid's Horehore Daisakusen' is an action game that was released from Nichibutsu in 1987. Kid, who has been drawn into the space-time labyrinth from the 23 century, fights to escape from a large track of the enemy in order to return to the present day. Players defeat enemies with dropping in holes with using items, to escape from the times, such as primitive times and the Edo era and contemporary. Arcade Archives: Kid's Horehore Daisakusen was released on Switch 253d ago in the US and the UK. 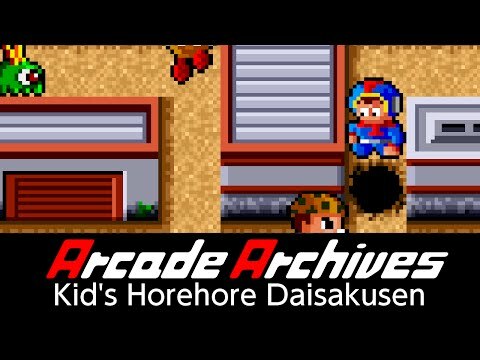 Notify me when Arcade Archives: Kid's Horehore Daisakusen is available.